Nikujaga (肉じゃが?) 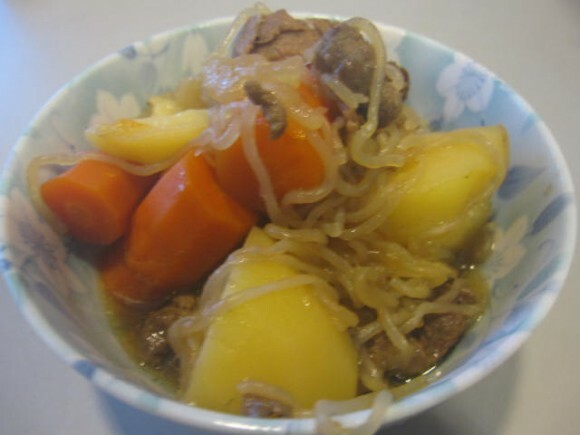 (meaning meat-potato) is a Japanese dish of meat, potatoes and onion stewed in sweetened soy sauce, sometimes with ito konnyaku and vegetables. Generally, potatoes make up the bulk of the dish, with meat mostly serving as a source of flavor. It usually is boiled until most of the liquid is evaporated. Thinly sliced beef is the most common meat used in Nikujyaga, although minced/ground beef is also popular. Pork is often used instead of beef in eastern Japan. Nikujaga is a common home-cooked winter dish, served with a bowl of white rice and miso soup. It is also sometimes seen in izakayas. Nikujaga is considered comfort food, and some Japanese claim they crave it if they do not eat it for a long period of time. Nikujaga was invented by chefs of the Imperial Japanese Navy in the late 19th century. The story that Tōgō Heihachirō ordered naval cooks to create a version of the beef stews served in the British Royal Navy was devised as part of an ongoing campaign beginning in 1895 to promote the city of Maizuru, Kyoto, which hosted an Imperial Japanese Navy base where Tōgō was stationed, as the birthplace of nikujaga. The municipal government of Kure, Hiroshima, responded in 1998 with a competing claim that Tōgō commissioned the dish while serving as chief of staff of the Kure naval base. If you want to read more, go to this page. 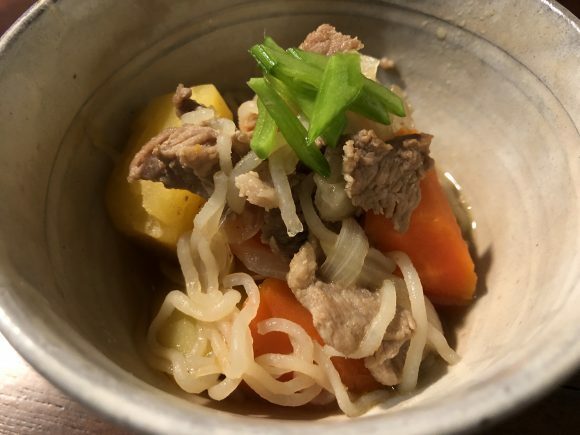 Shirataki (白滝?, often written with the hiragana しらたき) are very low carbohydrate, low calorie, thin, translucent, gelatinous traditional Japanese noodles made from devil’s tongue yam (elephant yam or the konjac yam). 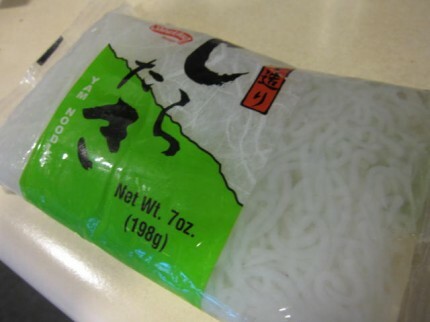 The word “shirataki” means “white waterfall”, describing the appearance of these noodles. Largely composed of water and glucomannan, a water-soluble dietary fiber, they have little flavor of their own. There used to be a difference in manufacturing methods; in the Kansai region of Japan, ito konnyaku was prepared by cutting konnyaku jelly into threads, while in the Kantō region, shirataki was prepared by extruding konnyaku sol through small holes into a hot lime solution in high concentration. Nowadays, both are prepared using the latter method. Ito konnyaku is generally thicker than shirataki, with a square cross section and a darker color. It is preferred in the Kansai region. 7 Add dashi, cook, until potatoes are tender, and add seasonings. Cook over medium heat for 15 min.